Yotsuba may be a big five-year-old girl, but she certainly is still distractable. On the way to Ena's house, she decided to go exploring and wandered into an udon shop. Luckily, the shop owners don't mind her watching how udon is made. Will they be able to track down where this little green-haired sprite came from? Yotsuba learns all about pizza as well. It's not the size of an egg, like it looks in the advertisements, but it's the size of a...sink? Anyway, it's really easy to overeat on something as tasty as pizza, so maybe Yotsuba will learn another valuable lesson today. In fact, Yotsuba isn't the only one to learn a lesson. Juralumin got too close to a dog while she was playing with Yotsuba and Miura, and now she's slimy and smells like dog! But after a bath, and a trip through the dryer, she seems to have forgotten how to speak! But Asagi is a teddy bear surgeon, so there's still hope. Life is full of lessons, and Azuma shows the world to us through the gentle ways of this neighborhood. Here, shopkeepers pose for pictures and answer neverending questions, puppies attack with kisses instead of teeth and the biggest disaster is some rogue bugs in the chestnuts. Yotsuba&! Volume 11 continues to treat the reader to the life of the Koiwais and stories of growing up. Lows: Perhaps Yotsuba is doing just a bit too much wandering on her own. 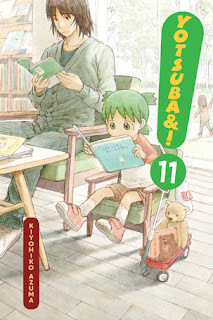 Verdict: Yotsuba&! Volume 11 is a wonderful volume that continues to be a well-anticipated treat.